Lawrence Heights is a community in the northwest of Toronto. It is bounded by Highway 401 to the north, Bathurst Street to the east, Briar Hill Avenue to the south, and the CN railway to the west (just west of Caledonia Road). It is approximately 9.5 square kilometresin area. The neighbourhood struggles with poor access to services, isolation, and lower socio-economic indicators when compared to the City of Toronto. In 2006, 35,945 people lived in the priority neighbourhood. 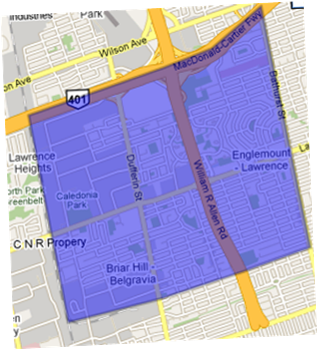 In 2005, Lawrence Heights residents had an average after-tax household income of $56,440, compared to the City of Toronto’s average, $63,870. The incidence of low income after- tax in Lawrence Heights is 20.9%, compared to Toronto at 19.4%. According to the 2006 Canada Census Lawrence Heights has a very large immigrant population with over 51% residents being foreign-born. More than 16% of those immigrants arrived in Canada between 2001 and 2006. Of those recent immigrants, top origins are Southeast Asia (i.e. Philippines) (35%); Eastern Europe (17%); Western Central Asia and the Middle East (10%); South America (8%) and Africa (8%). In 2004, the United Way, in a joint initiative with the City of Toronto and with the support of the Canada and Ontario governments, formed the Strong Neighbourhood Task Force, with the goal of building an action plan for revitalizing Toronto neighbourhoods. In 2005, the task force released a report, Strong Neighbourhoods: A Call to Action, analyzing Toronto’s 140 neighbourhoods. The objective was to identify those neighbourhoods where public investment in local services has not kept pace with demographic shifts, population increases, and growing social needs. The analysis measured services, facilities, challenges, and the vitality of each neighbourhood. Through the task force analysis, Lawrence Heights qualified as a priority area with poor access to services, facing significant challenges, and in need of social and physical infrastructure investment. The Local Immigration Partnership seeks to participate in that investment process. In addition, Lawrence Heights is also currently undergoing a Revitalization process. Land owned by the City of Toronto and public housing units managed by the Toronto Community Housing Corporation (TCHC) are slated for renewal. Revitalization has four goals: (1) to replace housing; (2) to improve the layout of the neighbourhood; (3) to engage and support the community for the future; and (4) to create a financially responsible plan for revitalization. The City’s plan for Revitalization is accompanied by a Social Development Plan, which looks at the local labour market, social services, community development, and programming. For information on LIP in Lawrence Heights please refer to the Lawrence Heights Settlement and Employment Strategy & Action Plan.